Like I mentioned last month, the costs of the renovations reflect in May expenditure. We lived above 100% of our income in April. Yes, we had a shortage. The bulk of our money went to the renovations. Meaning, its an investment rather than consumption. We are back on track with 21% expenditure. We had to squeeze ourselves to pay up the mortgage off course. Its been a tough year. 37% Target is 25% . Personal Income 86% 56% We are working on growing other income streams to bring this lower. Interest/ Dividends 1% 6% Our emergency fund interest. Real Estate 10% 10% Still due to renovations. Invested 79% 51% We paid most of it into our homeloan. I no longer top my Just Invest (Nedbank) savings up. We lived on just above 20% of our income in May (comparing to 134% in April). Our Net Worth grew well. MAIN GOAL: net worth growth by at least 25%.-- 16% so far. 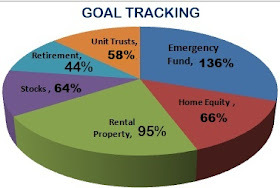 BUDGETING: invest at least 40% of income.-- 48% so far.